The weekend saw the Battle in the South West IV in Western Australia and the return of the AthleteHUB. The aim of the Hub is to help athlete’s perform better through various techniques and facilities inclusive of chiropractic, physiotherapy and massage and of course incorporates the much loved ice baths recovery facilities. The HUB is available to all sports and lends itself particularly well to CrossFit competitions where athletes are faced with many intense and gruelling events spread over a couple of days. The nature of the events means that athletes are putting their entire bodies on the line, leaving no muscle left untouched by the intensity of competition and ensuring that the necessity for full body ice baths immersion is essential to recovery. As with any form of recovery, there are athletes who choose to follow a strict routine to ensure that they stay event ready and can back up their performances hour in and hour out. For some this means that numerous techniques including physio, massage and ice baths for example are all employed between each event to ensure that the body has taken the necessary steps in order to rest, repair and recovery in between each competition. In relation to the ice baths specifically, some athletes choose to only immerse their forearms for example if they have just undertaken a high intensity lifting event for example, whereas others are sure to immerse their whole body, ensuring an entire body cool down. These particular athletes are regular visitors to the “hub” facilities during the day or two of competition and find that that is the best option for them regardless of whether this may be contrary to generalised recommendations. There are those athletes who visit recovery zones at the completion of each day of competition and ensure that they take the necessary steps to satisfy their own recovery requirements. Again, this may involve a single element such as cold therapy and ice baths or may be inclusive of numerous facilities. The consistent element with these athletes in relation to ice baths is that they like to maximise their cold or contrast water immersion times and take the time to recover for the entirety of the recommended period. The last of the examples relates to the athletes that intensify their recovery at the completion of the overall event. Much like those who recover daily, these athletes generally choose numerous recovery options such as physio, massage and ice baths and undertake them at a high intensity ensuring that the rigours of the events are rubbed or chilled away as best they can be. As is the case with sporting events across codes, there are those at the more professional end of the spectrum who are the ones that have been involved with a particular sport for a long period of time and who take competition very seriously. These are the marathon runners who finish ahead of the packs of thousands for example and have been training for prolonged periods of time to ensure that they are event ready. They are well versed in their preparation and performance strategies and subsequently also have their own recovery routines which you can be assured includes ice baths therapy as one of the main elements. It is an innate quality for competitive athletes that they not only search for the winning edge but that they also do what feels best for them and what they have proven to themselves is a winning formula when it comes to recovery. Somewhere in the middle of the spectrum are those athletes who take the event seriously enough to train semi-regularly and perhaps are participating more as a personal challenge rather than to be a serious contender. Although these individuals recognise that they have to look after their bodies, particularly in the lead-up to competitions, they don’t necessarily invest in their recovery in terms of ice baths therapy for example as they aren’t familiar with the practice exactly and perhaps would feel more comfortable taking any ice baths in a communal environment where there are professionals on hand to guide them. These are the athletes who present to recovery zones with a look of enthusiasm and uncertainty and ask, “ok, so what do I have to do”? The opportunity for these recovery style hubs to not only provide a physical service but also to provide an educational one is invaluable to all those athletes who are looking for some guidance. If these individuals are competing against themselves to achieve their own personal best and they can improve significantly by employing some helpful and relevant recovery strategies, then this is definitely a victory in itself. 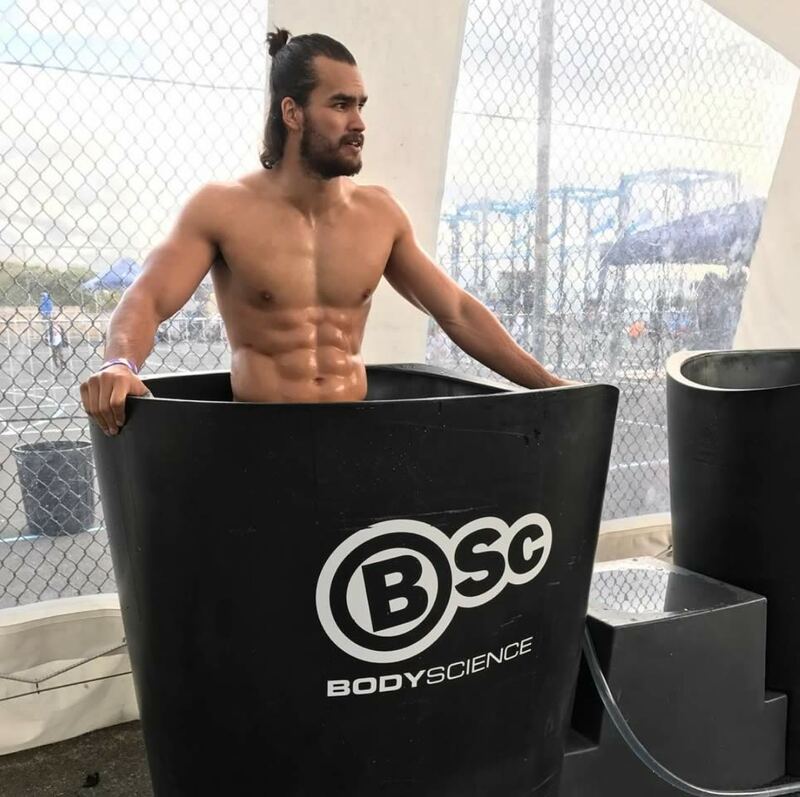 Whether these recovery facilities are run by event organizing bodies or by external organisations such as the RecoveryHUB in Western Australia or the Queensland Based RecoveryBar, one consistent feature of the Pride on the Line Recovery ice baths is that they can be branded accordingly to be on point with either scenario. 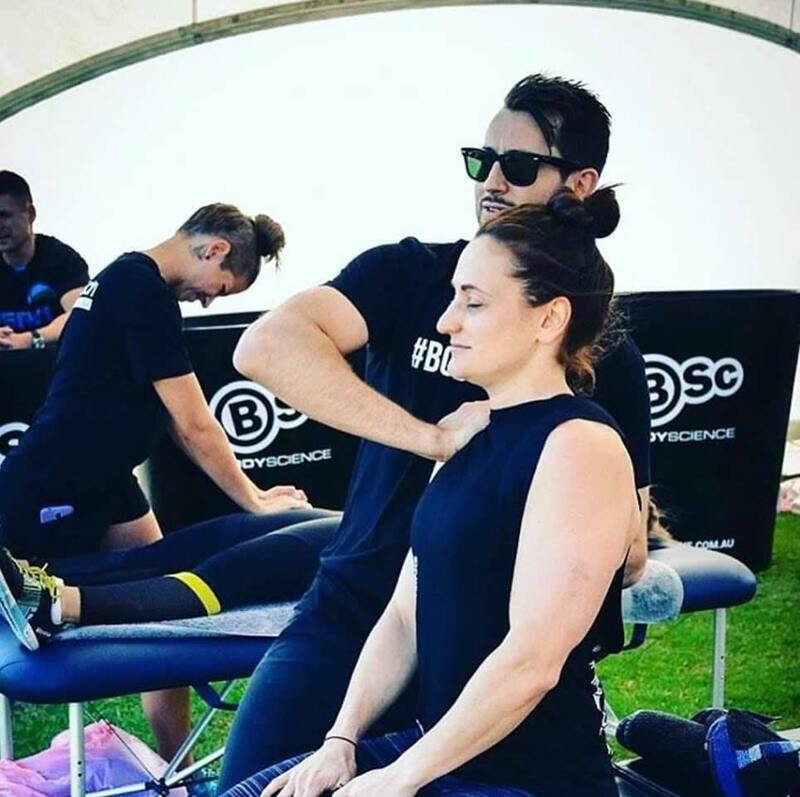 The below image of Dr Andrew Alekna assisting a patient at the Battle of the South West showcases the consistency of branding with the dominance of black and white and also highlights the fact that the ice baths provide a fantastic and unique branding opportunity, clearly showcasing the Body Science logo in this instance. We couldn’t go without mentioning what we’ve always maintained which is that the ice baths provide a great opportunity to capture brilliant images of athletes in a static environment. The images below of both the Recovery Bath Compact and the Recovery Bath Duo highlight this point fantastically well and reiterate once again the strength of the branding. So the next time your club or organisation has a competitive event, consider whether it will be adequately equipped with recovery provisions such as ice baths to enable the athletes to back up their performances event after event. If the answer is no, consider contacting Pride on the Line so that we can provide the perfect ice bath solution or alternatively we can point you in the direction of a recovery provider who will be able to assist. We look forward to hearing from you!